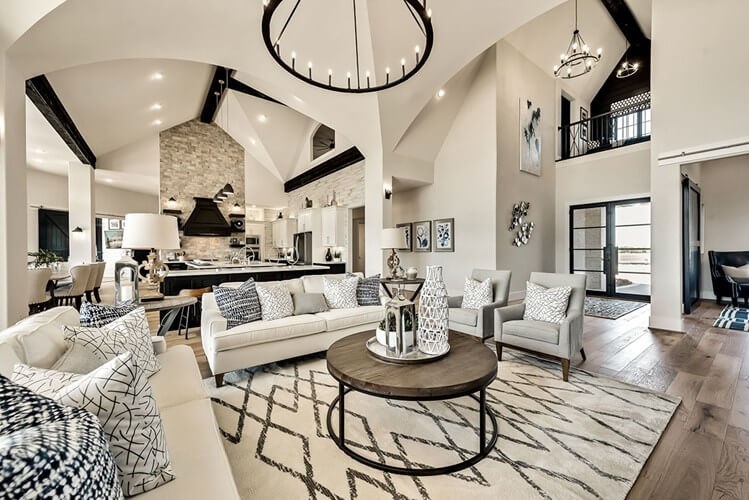 Open, spacious great rooms are super trendy right now, as seen in the Grand Whitestone floor plan by Grand Homes in Sachse, TX. When it comes to the wide adoption of home design trends, there’s a bit of a chicken-or-egg debate — do the design trends result from the TV shows or do the TV shows pick up existing designs? According to Stephen Yerrakadu, Director of Architecture for AV Homes, Inc., the answer is clear. “I believe that the design comes first and television shows then celebrate and support the designs and a casual lifestyle. And then, because a lot of people are watching these shows and coming to us for something similar, we have an opportunity to provide those designs to more people.” In other words, the designs and the TV shows work in tandem to create huge trends. So what are the latest trends to influence new homebuilders? Yerrakadu says he’s been seeing larger islands, larger pantries, open living space, great rooms, and mud/laundry rooms. It’s all about a casual, practical, and comfortable lifestyle that is family-friendly and entertainment-ready. Brown has noticed the rise of smart homes. “People want the newest and greatest things. When it’s on a TV show, they want that. One thing that has really come to the forefront is smart homes. That has really shaped our buyers, and it has shaped how we design and build houses. So when buyers come in, they want those gadgets, and we have to make sure we have those products to offer those buyers.” You may have noticed that HomLuv has been publishing more and more on the topic of smart homes, covering everything from hubs, to lighting, to security, to thermostats, to appliances, and more smart home tech. This is actually a trend with a high adoption rate and staying power, so it’s wise that builders are paying attention and incorporating smart home technology into new homes. So which HGTV shows are exerting the greatest influence on homebuyers and builders? Fixer Upper, even though it has ended, is still a big influencer. Flip or Flop is also still a big one, and the show has several spinoffs including the new Flip or Flop Nashville. Newer shows, like Restored by the Fords (a brother-sister duo renovate homes in rural Pennsylvania while preserving their historic charm) and Rustic Rehab (a husband-wife team in California that turns outdated cabins, vacation rentals, and bungalows into charming retreats), are growing in popularity and influence by the day. Coming in 2019, HGTV will launch a new show with Christina El Moussa called Christina on the Coast. The show will feature Christina working directly with clients to design their dream spaces, you can be sure homebuyers will be paying attention. For the last 16 years, Rachel Kinbar has been a writer of articles, blog posts, white papers, essays, infographics, web copy, sales copy, scripts, poetry, lyrics, and more. She is the former editorial and marketing director of a creative content agency in Europe, where she resided for 11 years. Now back in the U.S., she is continuing her writing career and with her sister has co-founded Kinship Design Marketing, a boutique agency that provides marketing strategies and content for architects, interior designers, and landscape designers.